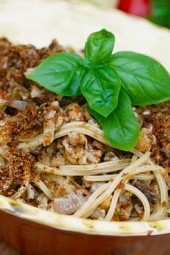 or spaghetti and topped with toasted breadcrumbs. If this sounds like a strange combination to you, don’t knock it until you’ve tried it! , which they sell on Amazon, or in any Italian specialty store, or if you’re lucky enough to have a good Italian section in your supermarket. To keep the points lower, I suggest using a high fiber or low carb pasta. Here is a list of some low point pastas you can find in your local supermarket. Buon appetito! Heat a nonstick frying pan on medium heat and spray with Pam. Toast breadcrumbs until golden, careful not to burn. Set aside. Sauté onions and anchovies in oil on medium heat until anchovies melt and onions are golden, about 1 – 2 minutes. seasoning and simmer 2-3 minutes. Add cooked cauliflower, chicken bouillion and pepper to taste and cook an additional 5 minutes. When pasta is cooked, divide pasta in 6 bowls (about 1 cup each). 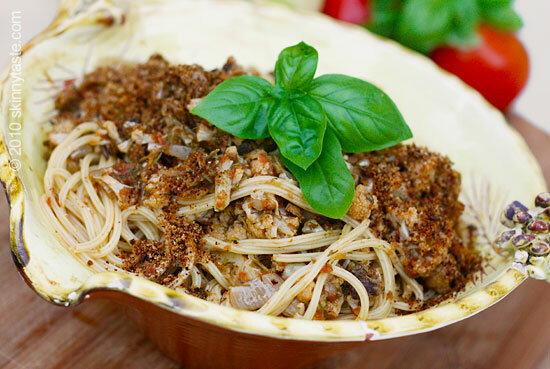 Top each bowl with sauce and 1 tablespoon toasted breadcrumbs and serve. Also, by chicken bouillon do you mean chicken stock and could you please advise if by 1 you mean 1 small cube?! thanks! Gina, is it possible to substitute the butter flavored pam with 75% less fat butter?! Thanks! Looking forward to trying this Sicilian dish as my Neopolitan mom did not make this when I was growing up! The can of sauce with sardines is sold in most supermarkets in NY. I think you need to update the link for "lower points pastas" for the points plus plan. I have tried both the Tofu and Shirataki noodles, and they are just that: NOODLES…They do NOT have the TASTE or TEXTURE of pasta in any way. Maybe I am picky because I am Italian and have made homemade pasta/ravioli many times. But they are only good as noodles in soups and Asian stirfry noodle dishes! Thank you again, Gina for all your delicious healthy recipes! I am down 22 lbs (and counting) with the assistance of your recipes Gina! I have to make this for my Sicilian mama. She use to make something very similar. Brings back so many memories. A traditional St Joseph's Day pasta dish….my Grandma always made this for my dad and I am sure she's whipping up a batch right now for him…full fat version though lol. my name is gina also! i ordered the condiment for pasta and cant wait to try it. thanks for the link! It's a great Sicilian dish! I love this post, Thanks for the recipes. Gonna try this one this week and thanks very much for the heads up on the high fiber pasta. I grew up eating this dish–of course it was the "fully leaded" version, but I am delighted to see it here. Thank you! Can't wait to try it. Thanks for all your comments! Pam is a oil spray. You could also use olive oil spray or if you have a misto, you could use that. Glad you found me Alisa! I can't believe you have this recipe. I have been eathing this my whole life and we love it, I'm glad to see it here. My family is from Sicily and we call it Melaneza. You can find this at italian specialty stores. We ate this on Fridays during Lent. Thanks again. It looks wonderful. Im saving this recipe to make soon. I saw your blog from the foodie blog roll and Im glad I came here. I look forward to reading more of your post. Gina, thanks for introducing us to another authentic Italian dish. The real Italian dishes are always healthier than the American versions of Italian food. Everybody MUST try this…I am sure it is buonissima!!! I really love to eat pasta dishes. Will try this soon. Thanks for sharing. Hi Gina, I have super Italian deli just over the border here from Lugano. Switzerland and I am sure I can find the Pasta con Sarde or he could get it for me. However could you tell me what butter flavoured Pam is? I just really love your site. As I can give my husband Pasta at every meal in any shape or form or taste then this will be just perfect. Hi Gina, I am a WW… and I love to cook. So your blog is a real treasure! Oh I'm going to spend a lot of time here!!!! YOur pasta dish looks marvelous. So nice to find you this evening. What kind of pasta did you use? It looks like a thick spaghetti with ridges. Looks so neat! Gina, this looks fantastic. I think you're in NYC…have you ventured to Eataly yet? You're going to be in heaven! All the sites/tastes/smells. Looking forward to trying some WW friendly recipes with the amazing, fresh ingredients from there. Yes! The seasoning has sardines, fennel and raisins. It's a quick dish to put together, I was at her house while she prepared it and it took her less than 30 minutes start to finish. I notice no sardines in the ingredients, just anchovies. Is the seasoning where the dish gets its name? You are right anchovies are not healthy but sardines are ??? Somethings incorrect here.